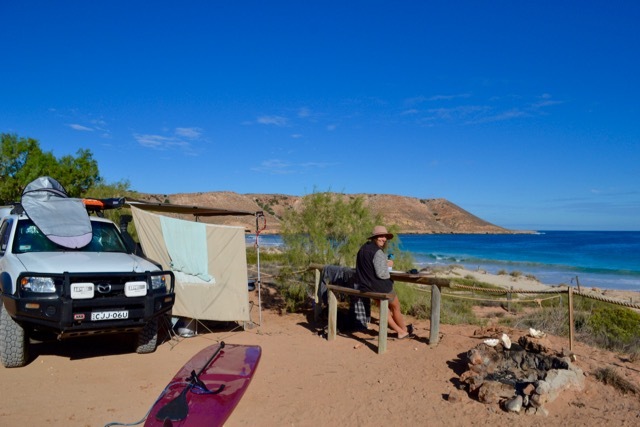 Jono has dreamed of surfing Red Bluff and various Gnaraloo Station breaks since his teenage years, and so was looking forward to the Carnarvon portion of our trip almost more than any other. Keeping an eagle eye on the surf charts in the weeks leading to our arrival, he watched as the swell he was hoping to materialise … didn’t. We determined to visit both places anyway, even if only to see them in the flesh sand. Arriving in Carnarvon after the 325 kilometre drive from Shark Bay (you can read our Shark Bay post here), we checked Claude into storage, filled our car with diesel, did a shop and departed again post-haste. About twenty minutes up the road Laura looked in her side mirror and saw something huge and colourful flapping in the wind. This turned out to be our beach towels and a jacket, which Jono had placed on the car roof while packing the car after our grocery shop. Somehow, they’d wrapped themselves around our roof racks instead of flying away. Their good fortune in not disappearing placed them somewhere between our windscreen shield (lost in a similar recent incident) and a packed lunch (luckily found and eaten before we drove away). The offence, however, counted as a third strike against Jono. As punishment he was forced to concede a half hour back massage credit to Laura. The rest of the 1.5 hour drive passed without incident. On arrival at Red Bluff we were excited not only by how beautiful it was, but also to see the wallabies and goats lining the track, and the eagles soaring above the ridge line to our left. To our disappointment we learned that dogs weren’t allowed at the southern end of the camp, which is where the surf is. 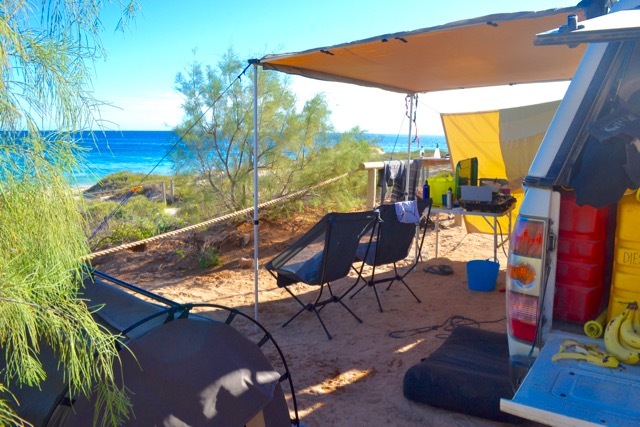 We set up directly in front of the office as far south as we could, and although our spot was awesome (it came with its own breakfast bar and had direct beach access), it was a 15-20 minute walk down the sand and around the headland to reach the reef break. 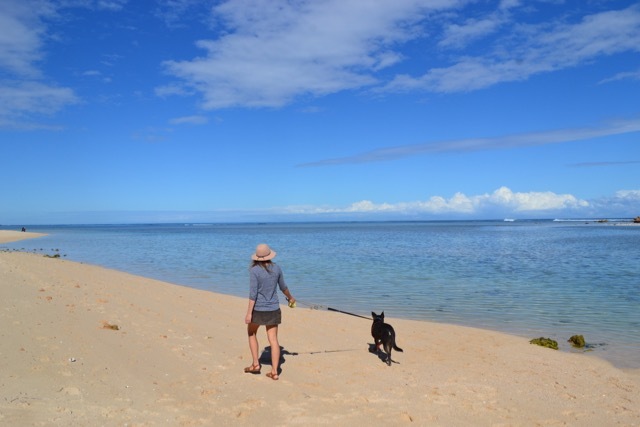 No-dog zone aside, our stay was everything we could have hoped for: the sun shone, the ocean sparkled, we enjoyed multiple swims, Neddy made a friend (Chilli, the homestead’s kelpie), and even in the absence of any real swell Jono enjoyed a couple of fun surf sessions. We also ran into a young surfer/nomad called Tom. 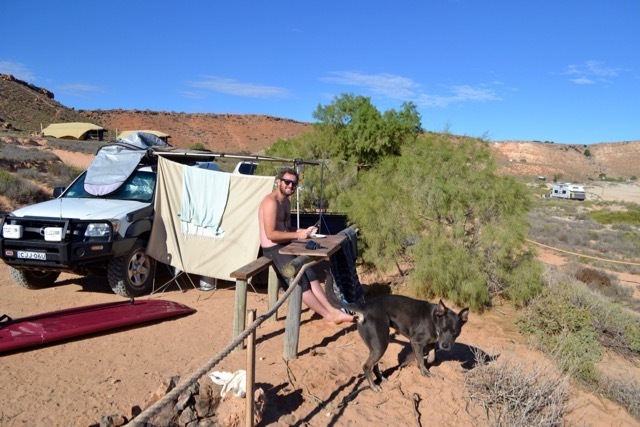 Including random meetings in Albany, Fremantle and Kalbarri, this was about the sixth time we’ve come across him and his scruffy little dog, Jezebel, while on the road. The three of us shared evening drinks and burritos, acknowledging whatever universal force has been behind the continual crossing of our paths. 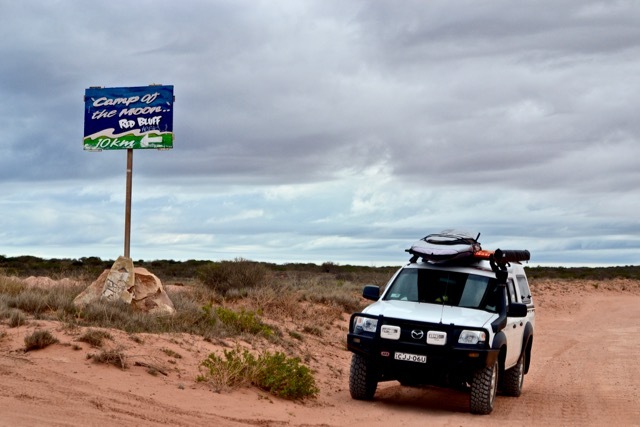 We stayed at Red Bluff for two nights before scarpering in the face of a predicted 50mL of rain. Word was that the access roads would most likely be closed and we didn’t fancy the thought of being stuck in a torrential downpour with a wet Neddy and only our swag for protection. Call us soft if you will. 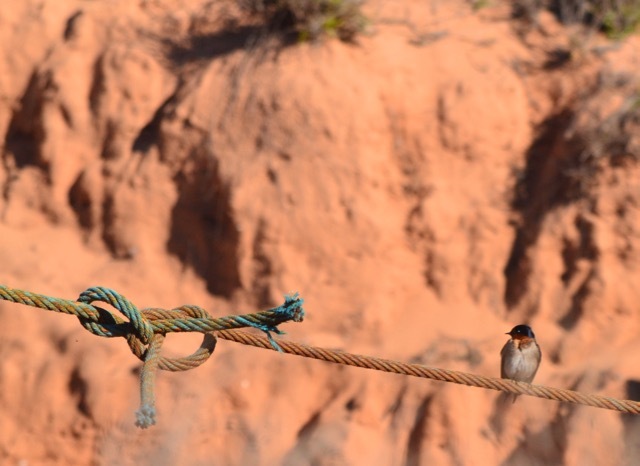 Following a soggy, movie-filled two-day mini break back in Carnarvon we returned for a second round at Red Bluff. 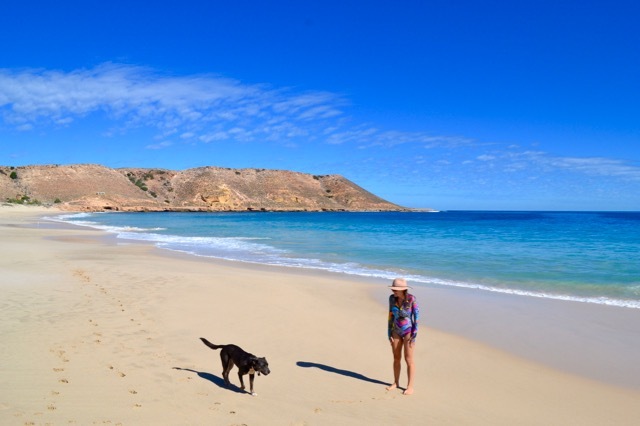 All the dog-friendly beach spots were full (punishment for our weakness!) and so we had to backtrack further north, which meant the surf was driving distance only. That didn’t stop us from enjoying ourselves, however. 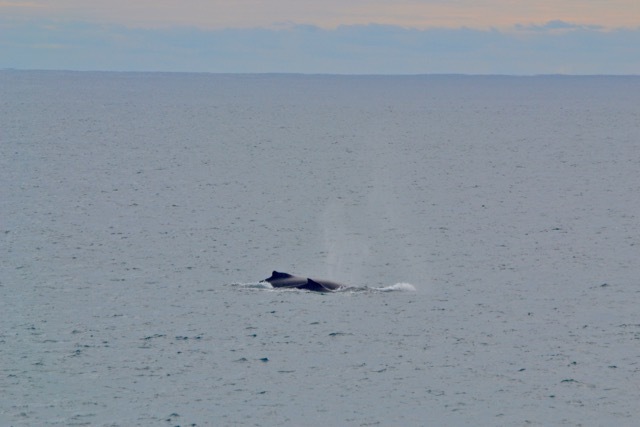 Our camp site offered some of the most spectacular whale watching of our trip so far. 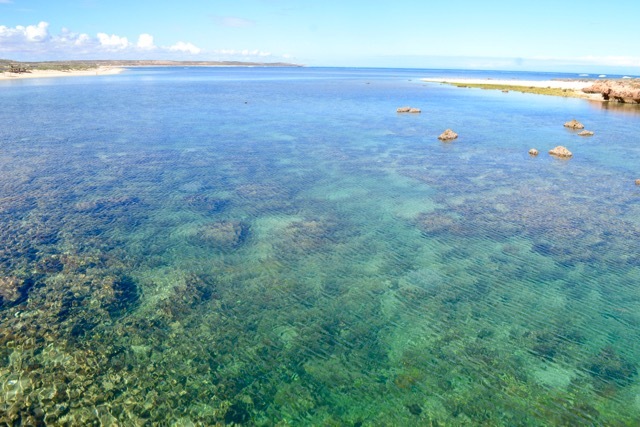 We lost count of the number who passed us by, including one completely mad humpback who breached within about ten or fifteen metres of the rock shelf which acted as our front lawn. We couldn’t believe it had enough water to land in. A small swell arrived while we were there and so Jono had another crack at Red Bluff in slightly bigger conditions. He also sourced a great deal of entertainment from the antics of one young kid, who was visiting with his family all the way from Queensland. They’d flown to Perth, hired a people-mover and were staying in a humpy … and somehow this boy had convinced his parents that a pogo stick was necessary cargo. To his credit he was using it with gusto, boing-boing-boinging over the extremely rocky and pogo-hostile ground. 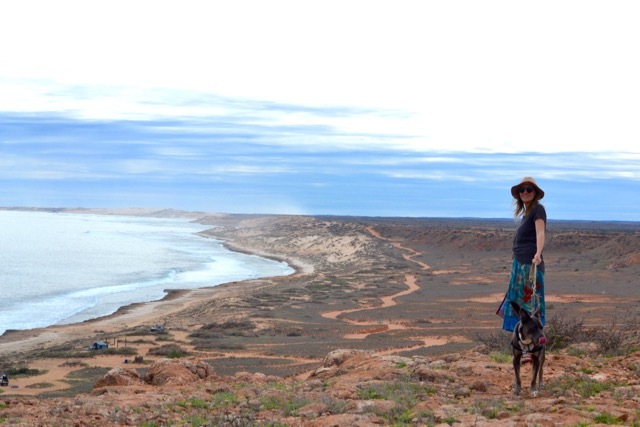 From Red Bluff we set off for Three Mile Camp at Gnaraloo, a neighbouring station not far up the road. 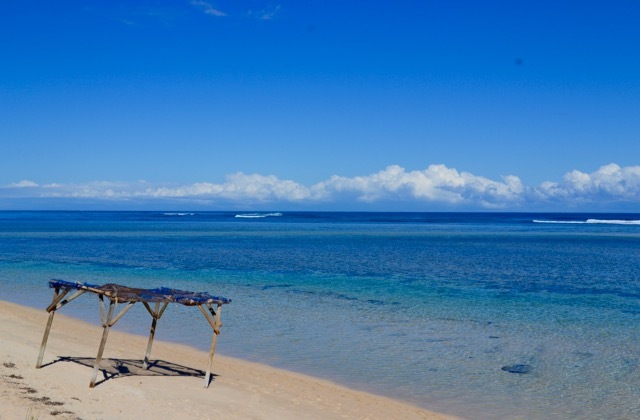 It’s home to numerous surf breaks, including the infamous Tombstones where a man recently lost his life in a tragic incident after hitting his head on the reef. Jono was frothing on the news that a solid swell was forecast to arrive in the afternoon of the next day. 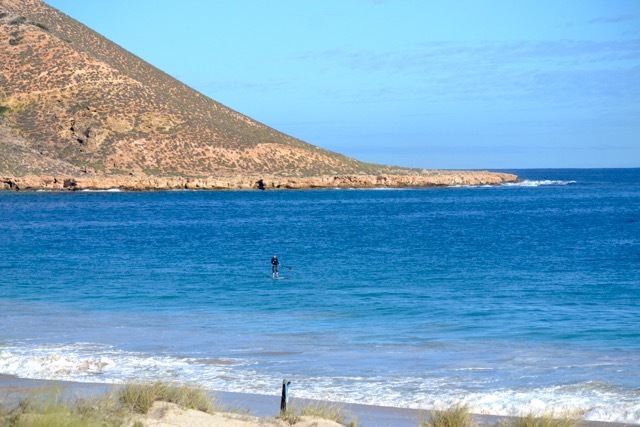 So, after breakfast, just to make sure we didn’t miss anything, we went for a surf check at Tombstones. 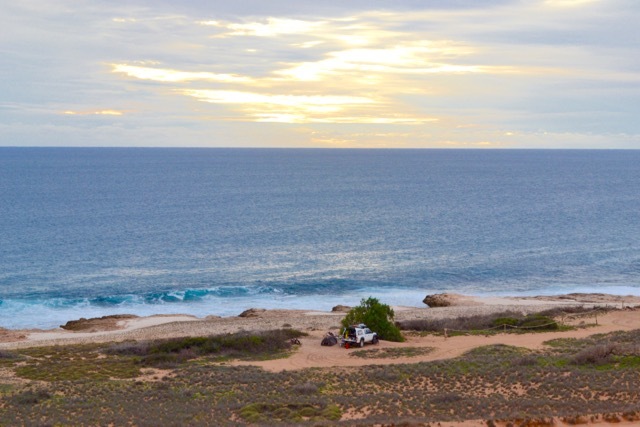 We were sitting, waiting for the waves to arrive, when we started chatting with the occupants of the 4WD that pulled up next to us. 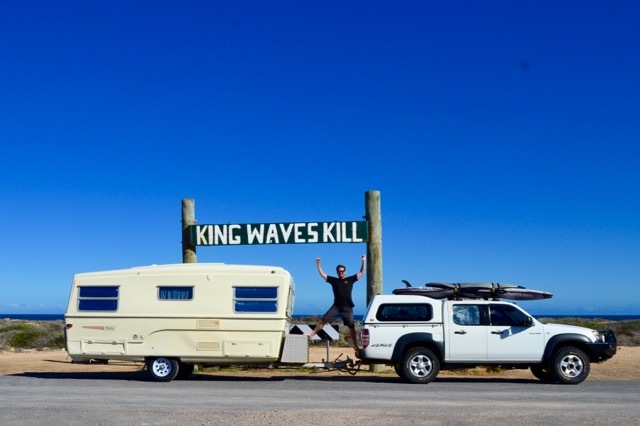 From the NSW south coast, Jon and Em are halfway through a 12 month trip around Australia with their sons, Nixon and Raff (Em keeps a blog about their adventures, which you can check out here). It was awesome to meet such nice people doing the same thing as us and we were also super impressed with how well behaved their kids were. While Neddy barked repeatedly during our conversation (‘Pat me!’, “Throw stick!’’ – that kind of thing), we didn’t hear a peep out of Nixon and Raff. Aren’t pets supposed to be the easier version?! After a while Jon, Em and the boys headed down for a snorkel at a nearby cove. The swell hadn’t arrived but the waves looked smooth and fun. Jono suited up, and Laura had just about talked herself into going in, too. It was at this point we realised we’d left her surfboard fins back at the caravan … So that put paid to that idea. Settling herself in the sunshine next to Mr Bark-a-lot Laura assumed the role of photographer. Not too many minutes passed before Jon reappeared. It turned out Em was toying with the idea of getting in the water and was keen on some company. After learning of Laura’s finless-ness Jon very kindly offered to lend her some – and even attached them! Then, positioning himself firmly as front runner for ‘Excellent Human of the Month’ award, he also offered to mind Neddy while she was in the water. The long paddle out was both a blessing and a curse, exhausting Laura enough to even out the excitement and fear that warred inside her as she thought about joining the Tombstones lineup. The waves seemed bigger than they had looked from the carpark so we hung on the inside for about half an hour during which time Em scored one nice wave and then another in. Laura only managed some white water, but since it was Tombstones white water she felt pumped regardless. Jono stayed out for hours, having a grand old time in spite of the fact that the predicted swell hit later than expected – pretty much on sundown – and peaked overnight. No good to anyone! 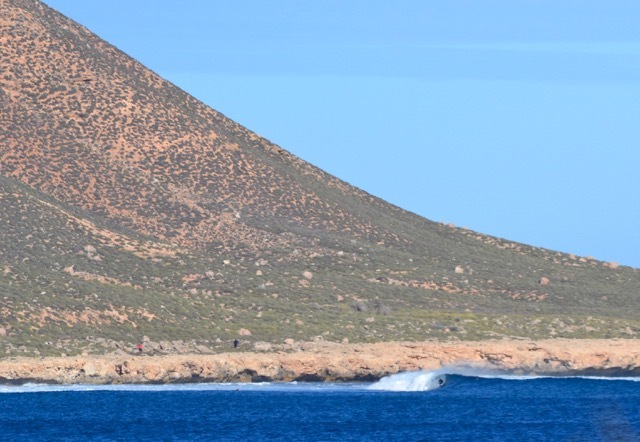 It was still up the next morning though so Jono paddled out again and enjoyed a few very crowded waves until the wind got into it. Just as the sun set the waves started to pump! 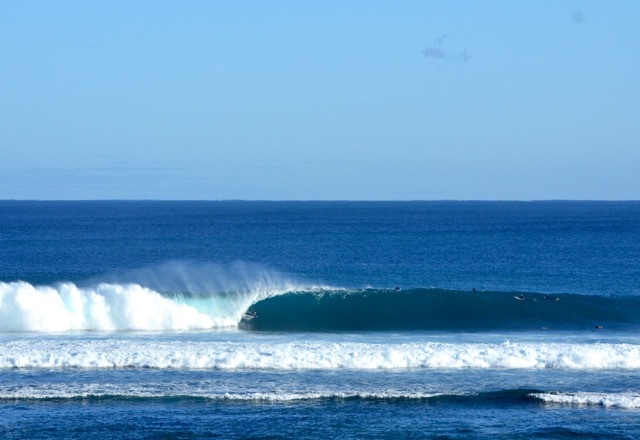 We’d had only the smallest taste of what this area had to offer, but with no other swell on the horizon – and a schedule to stick to – we decided to move on. We don’t have many trip regrets, but one of them is the lack of time in this area. We wish we could have stayed for at least month. Our time at Three Mile Camp was not long enough! We stopped in Carnarvon to collect mail but it hadn’t arrived. 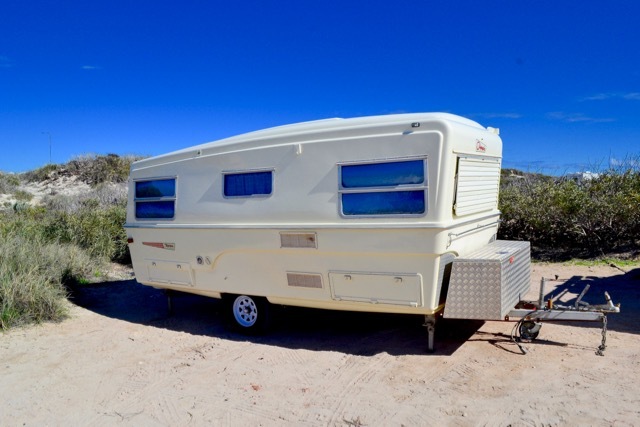 Since we didn’t have much else to do besides purchase another new set of tyres for Claude (we bought the wrong bloody ones in Geraldton; they weren’t strong enough; we don’t want to talk about it! 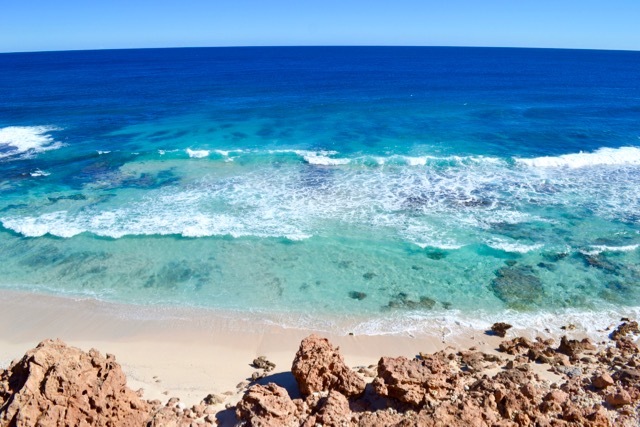 ), we headed to Carnarvon Blowholes on the advice of a guy who said he’d had a better snorkelling experience there than in Exmouth and Coral Bay combined. We stayed one night and weren’t disappointed. 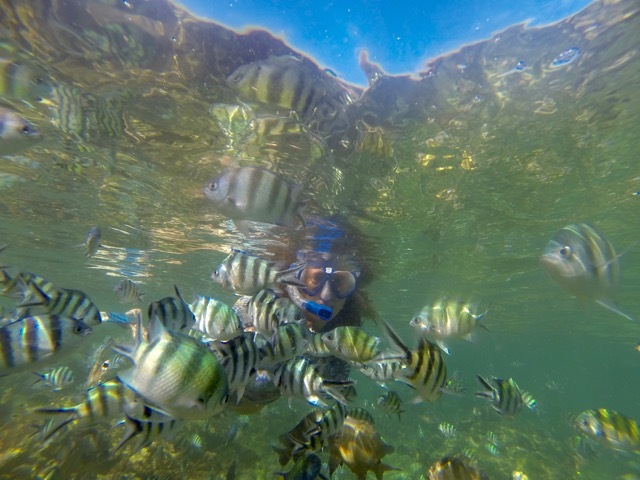 Although the coral wasn’t as bright or as beautiful as what you’ll see in the Great Barrier Reef or Indo, in one little underwater bowl we encountered so many fish that Laura actually felt intimidated. 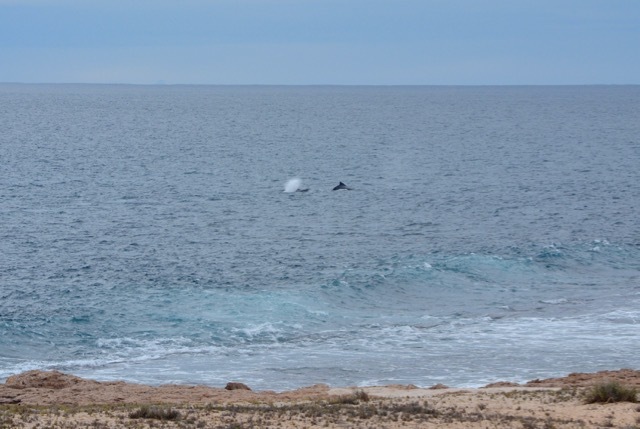 The blowholes themselves were also surprisingly cool, shooting metres into the air. The noise was something else, too – we could almost believe that water-breathing dragons were trapped beneath the rock ledge, hissing and spitting in displeasure. We nearly skipped this bit of paradise. Exmouth – and whale sharks! – would be next. 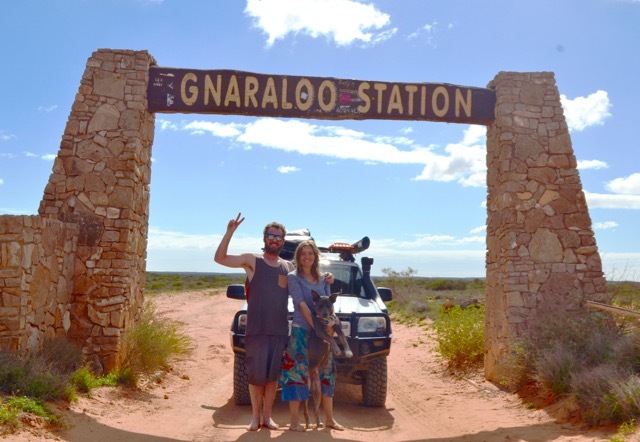 Previously an almost exclusive haunt of surfers – who flock there in a kind of pilgrimage – in recent times non-surfing travellers have discovered the draws of Quobba Station and the neighbouring Gnaraloo Station, which has resulted in a massive popularity spike. 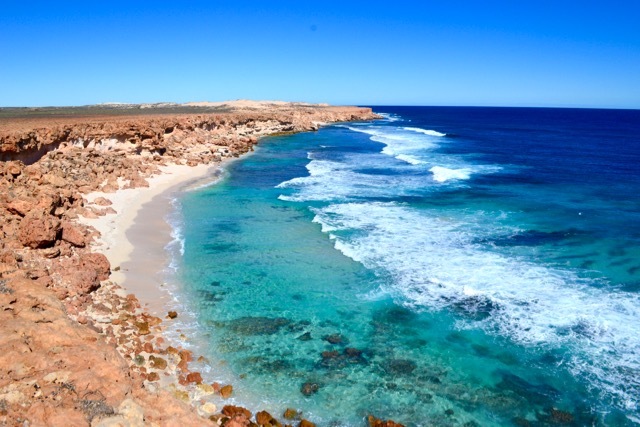 Located about 145 kilometres north of Carnarvon and accessible only via corrugated tracks, it’s preferable you have a 4WD to visit these places. Be warned, too, that the access roads often close after rain. 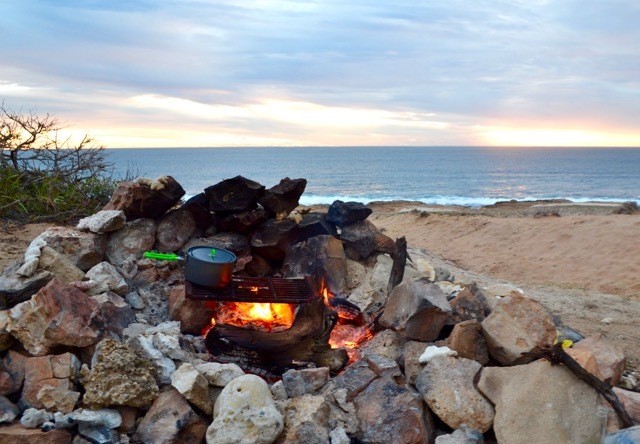 No power or water are available at Red Bluff on Quobba Station and when visiting in peak, winter season we paid $15 per person, per night for the privilege of camping there (and it was a privilege!). Basic drop toilet facilities are provided. As mentioned above, dogs are welcome, but not in the southern end of the camp, which is where the headland and surf are. On our final night there we grabbed a couple of dead, unconnected branches to make a little fire before learning that we had actually broken the rules. We felt terrible because it’s such a beautiful place. So read all the signs and don’t be stupid like we were! Camping info etc can be found here. 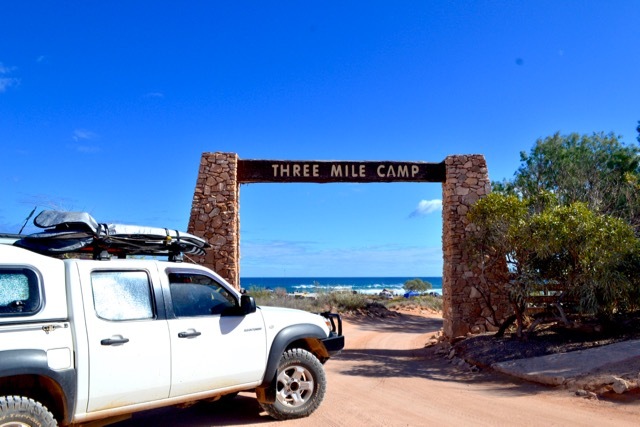 No power or water are available at Three Mile Camp on Gnaraloo Station, although (bore water) flushing toilets and showers are provided, as is a dish-washing station. In peak winter season we paid $20 per adult, per night, plus $2.50 for the dog. Be warned, there’s generators galore. Visting info can be found here. 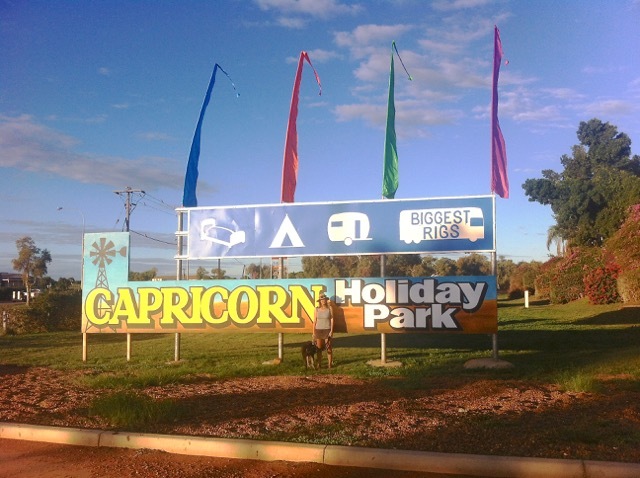 If you plan to visit Carnarvon itself, we stayed at Capricorn Holiday Park and highly recommend it. A special mention must go to Hayden and Jodie, who are just about the friendliest and most enthusiastic park owners we’ve come across. They run all sorts of optional events and get-togethers for their visitors, including a weekly pizza night. They also stored Claude for us at a charge of $8 per day. Find their website here. 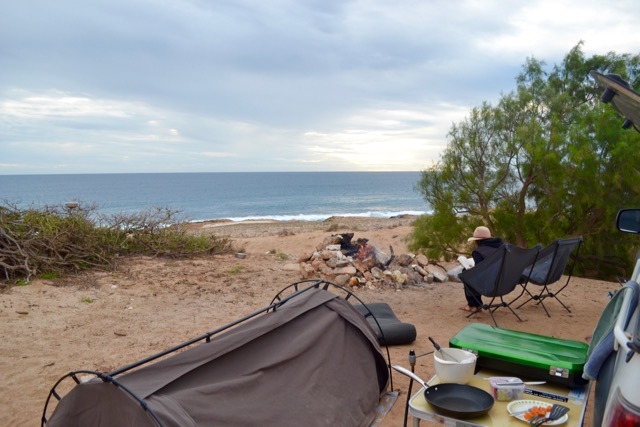 The Blowholes Campground offers basic camping at a cost of $11 per person per night (you can find more info here). There’s no water and toilets are only available in the day-visit area (although they do remain open overnight). If you visit we highly recommend snorkelling in ‘the aquarium’. 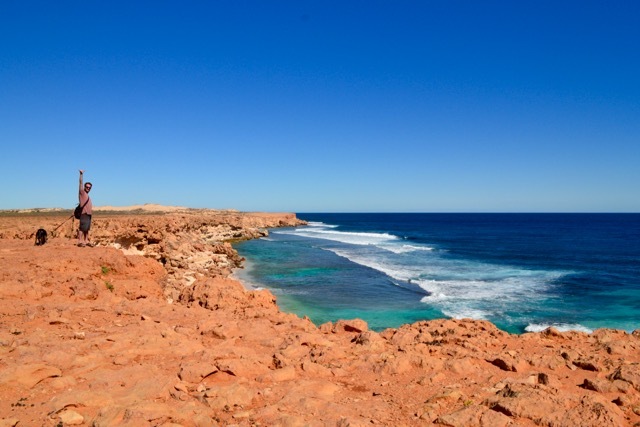 You can access this by walking down to the sand from the carpark (in front of the toilets), turning right, and following the rock ledge until you reach a submerged pool. There you will find fish galore! 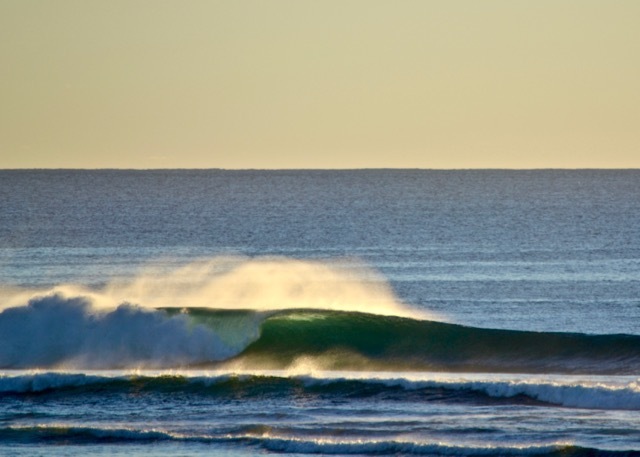 Long left reef breaks! 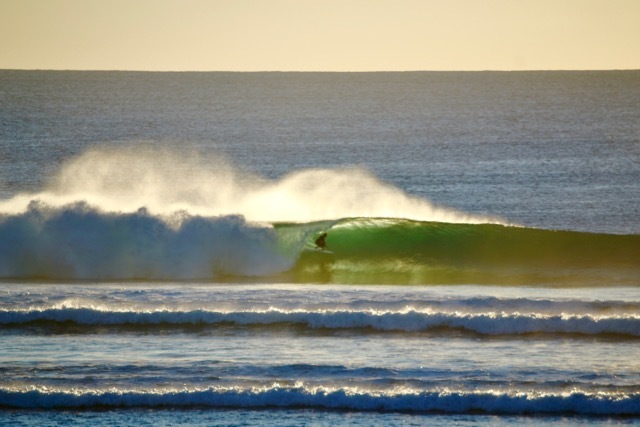 My goodness I want to surf there! Great post thanks.. Quick question when you leave the mothership and camp do you have a fridge in your car. If so what size is it? Hey Caroline, we bought a secondhand 40L Engel a few months back and we do keep it in our car. It’s not the duo (ie it can be either a fridge OR a freezer; not both at the same time) but that hasn’t been an issue for us. It’s one of the best things we’ve bought so far!